Eirian Owen was born in the Choir’s native rural community of Llanuwchllyn near Bala. A gifted pianist from a very young age she graduated with first class honours in music from the University of Wales, Bangor and holds the ARCM diploma in piano accompamiment, together with a postgraduate diploma awarded by the University of Manchester. She spent the early years of her career as head of the music department at Ysgol y Gader (High School) Dolgellau before her appointment to the staff of the renowned Chethams School of Music in Manchester where she served for twenty years as staff accompanist and piano tutor. Throughout those years, as in the present, she also had a busy private piano and vocal tutoring practice at her home in Dolgellau. She was appointed accompanist for Cor Godre’r Aran in 1970 and, subsequently, unanimously elected as musical director to succeed Tom Jones in 1975. Over the years she has voluntarily devoted literally thousands of hours to the Choir and was instrumental in developing and directing it to its ultimate success. Her exceptional gift as a pianist naturally led to her being very much in demand nation- wide as accompanist for soloists in eisteddfod competitions and at major music festivals. She has served many years on the panel of official accompanists at the National Eisteddfod of Wales and the Llangollen International Eisteddfod. She has accompanied most of the current generation of prominent Welsh soloists featuring in the world of international opera. Eirian was Chorus Master of the 1997 National Eisteddfod Choir and that role is being repeated when the Eisteddfod returns to Meirionnydd and Bala in 2009. 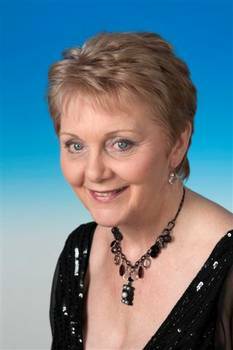 In 1998 she was Guest Conductor of New Zealand’s National Festival of Male Voice Choirs at a massed concert in Wellington. During 2003 she presented two series of programmes of classical music on BBC Radio Cymru. Recently she has performed as guest accompanist on several Swan Hellenic Cruises visiting the Far East, California, Mexico, Costa Rica, The Carribean, South America and the Mediterranean. In 1999 she was awarded the distinction of Honorary Druid by the National Eisteddfod’s Gorsedd of Bards and served as a choral adjudicator at the same event in 1999 and 2005. In January 2005 she was awarded an honorary MA degree by the University of Wales in recognition of her distinguished service to music.